Passports and travel tickets are the most important travel documents. Without them, you are likely to experience problems on your journey. You must also have valid visa to enter some countries. 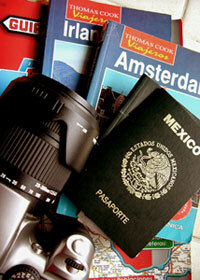 It is good habit to make sure to check passport and visa requirements well in advance of travelling anywhere. Do You Always Need Passport? US Passport Card can be used to enter the United States from Canada, Mexico, the Caribbean and Bermuda at land border crossings or sea ports-of-entry. This card is more convenient and less expensive but it cannot be used for international travel by air. Then a valid passport is always required. EU citizens need to show a valid passport or ID card when entering or leaving the EU external borders but not when travelling between EU countries. There are exceptions to most rules - EU citizens must show passport or ID card if travelling to an EU country that is not a full Schengen member. Non EU citizens always need a valid passport when travelling within the European Union. For up-to-date information about passport requirements when travelling within EU visit Europa, the official website of the European Union. Passports are though the most reliable identification document and they are universally accepted. We therefore recommend bringing valid passport on all international travel (even if only just in case). At least, always check beforehand with your foreign office if you are planning any travel without a valid passport. Do You Know When Your Passport Expires? Do not leave it to the last minute to check when your passport expires. Many countries require a passport to be valid for at least six months beyond the date of entry to the country. Therefore if you are planning to travel and your passport is due to expire in less than a year, you may want to renew your passport. You should also make sure you have at least one clear visa page in your passport for immigration stamps. Contact your foreign office for information how to apply, renew or replace your passport. Also double check all passport information with them prior to travelling. There are few simple but important passport security steps that you can take to reduce significantly the risk of losing your passport. These tips are also useful if you happen to lose your passport or if it gets stolen. If your passport is lost or stolen, report it immediately to the policy and then contact your nearest embassy as they can replace passports. Next: Do You Need Travel Visa For Your Destination?